Lady Leopard Sydney Hill sends a grounder to right field for an RBI single in the win over Bauxite. 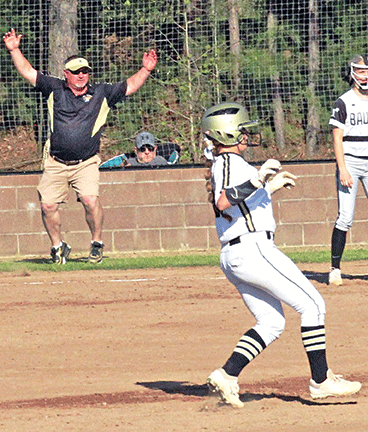 De Queen softball coach Tracy Nealy celebrates as Bailey Ward cruises into second base after driving in two runs against Bauxite. A fourth inning outburst gave De Queen an 8-6 softball win over visiting Bauxite April 2. The visitors took a 3-0 lead with two runs in the first and one in the second. The Lady Leopards got a run in the second and another in the third. The runs came in a bunch in the fourth. With one out Kinley Runnels singled. Carlee Helms was safe on an error. Hannah Phillips singled to load the bases. Haylie Melendez was hit by a pitch, bringing in Runnels. Bailey Ward singled to center, scoring Helms and Phillips. Lexi Taylor, who had homered in previous at-bat, drew an intentional walk to load the bases again. Tatyana Tramble grounded into a force out at home, but then Sydney Hill sent a grounder into right field. Ward and Taylor scored. Madison Runnels followed with a single to left to bring in Tramble with the sixth run of the inning. 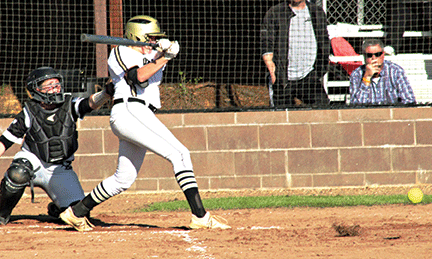 Bauxite managed a run in the fifth and two in the seventh, but never threatened to regain the lead.